Luton Town have completed the signing of highly-rated striker Aaron Jarvis from Southern League Premier Division side Basingstoke Town for an undisclosed fee. The 19-year-old forward has agreed a one-year contract at Kenilworth Road with the option for a second year, after scoring 17 times last season, his first in senior football, and opened his account for the current campaign last Saturday with a brace in the Dragons’ 5-0 win over Chesham United. 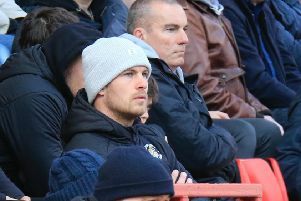 On the new addition, Luton boss Nathan Jones said: “We look at all levels to see if we can find ones that we can develop when they come into our environment. This opportunity came up a few weeks ago and we’ve decided to go with it. “We were going to maybe try to get Aaron in and have a real look at him first, but we weren’t able to do that so we are having a gamble. “We think that he has real raw attributes that once we get to work with him, and once we give him a bit of an education, plus a different type of game time, he could turn into someone that could be very beneficial. “We did it with Isaac Vassell. We are not saying we’re looking for the next Isaac Vassell, but we’ve got one in to develop and see if we can make him into a centre-forward for Luton. “He has shades of Danny Hylton in him, but he’s different to Danny and the other four that we’ve got.